Harlow Giles Unger is the author of more than twenty books on the Founding Fathers and early American history. 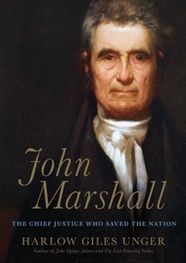 His latest book is “John Marshall: The Chief Justice Who Saved the Nation,” just published by Da Capo Press, a member of the Perseus Books Group. As the final hours of John Adams’s short-lived administration ticked away, the President faced a critical last decision: the nomination of a new Chief Justice of the United States Supreme Court. Former Connecticut senator Oliver Ellsworth, who had helped write the Constitution, was ill and had resigned as the nation’s third Chief Justice. Instinctively, the President turned to his old friend, New York’s John Jay, whom George Washington had appointed as the nation’s first Chief Justice in 1789. After five years, Jay was so bored with the job he resigned to become governor of his home state—and with good reason: The Supreme Court was not an important element of the American government, and its members had little or nothing to do. The Constitution and four of ten amendments in the Bill of Rights had shorn the federal judiciary of power and left the Supreme Court a relatively impotent appellate court, with almost no original jurisdiction. By 1800, when Adams searched for a new Chief Justice, the Court had issued only eleven decisions during the federal government’s 11-year existence—one a year. There simply weren’t enough federal laws on the books to provoke much legal activity, and most Americans were more intent on plowing land than filing lawsuits. Secretary of State John Marshall was in the President’s office when Jay’s letter of refusal arrived. Like Adams and Jay, the 45-year-old Marshall was a fervent Federalist intent on thwarting the radical changes in government that the anti-Federalist President-elect Thomas Jefferson was planning. In effect, Jefferson sought nothing less than a populist revolution, shifting power from the federal government to the states and extending the vote—then limited to property owners of means—to all white adult males. With Jefferson’s followers a majority in Congress, nothing stood in Jefferson’s way but the judiciary, and Marshall urged Adams to appoint as many Federalist judges as possible to frustrate Jefferson’s schemes. Born and raised in Virginia, Marshall had fought heroically in the Revolutionary War—at Trenton, Brandywine, and Monmouth—and shivered through the bitter winter at Valley Forge. After the war, he studied law, became one of Richmond’s most prominent lawyers, and a fervent champion of constitutional ratification. He won election to Congress in the Federalist sweep that lifted Vice President Adams to the presidency in 1796, and Adams sent him to Paris to help negotiate an end to the Franco-American naval conflict then raging in the Caribbean. Marshall’s tough negotiating skills earned him a hero’s welcome on returning to America—and appointment as Secretary of State, then the second most important federal post. “I replied that I could not tell. From the first, Marshall saw the High Court as a bulwark against executive and legislative tyranny, with the Constitution as the Court’s primary weapon. Like Moses, Marshall climbed the Mount and thundered commandments to those in government, asserting what “thou shall” and “shall not” do. Both Presidents Washington and Adams had violated constitutional restrictions on their power—each initiating wars without congressional authorization and, in Washington’s case, borrowing funds to finance government operations. Jefferson planned even more radical usurpations of power—the replacement of judges appointed for life with anti-Federalist jurists who supported the Jefferson political program. Jefferson’s first victim was William Marbury, one of President Adams’s last-minute judicial appointees. When Marbury demanded that Secretary of State deliver the commission Adams had signed, Jefferson ordered Madison to withhold it while he found am anti-Federalist replacement. Incensed, Marbury asked the Supreme Court for a court order, or writ of mandamus, to force Madison to give Marbury his commission. In 1803, John Marshall stunned Jefferson and the nation by declaring the President and Secretary of State in violation of the law. Under British rule, the king could do no wrong, Marshall conceded, but under the American Constitution, the President remained a citizen like every other American—subject to the law like every other American. A President of the United States had appointed Marbury to the bench and signed his commission, and a Secretary of State had embossed it with the Seal of the United States. For Jefferson and Madison to withhold the commission was a crime. In a second, even more consequential ruling, however, Marshall refused to issue Marbury his writ, explaining that the Supreme Court was an appellate court not a court of original jurisdiction and that Marbury should have applied first to lower courts for the writ. Marbury cited a provision of the Judiciary Act of 1789 that specifically allowed plaintiffs to bypass lower courts in seeking writs of mandamus. As onlookers gasped, Marshall then declared the provision unconstitutional. It was a declaration of historic proportions: For the first time in American history, the Supreme Court had exercised the power of judicial review and declared a federal law unconstitutional. 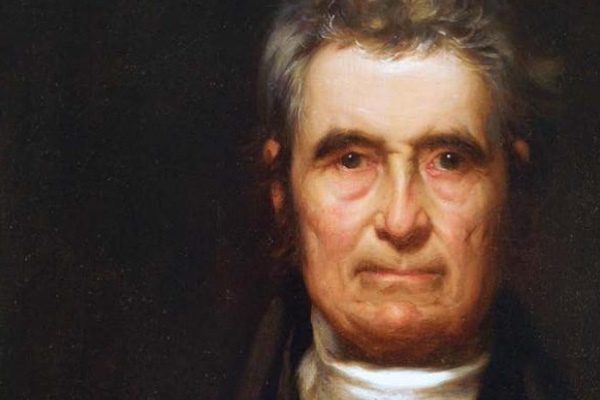 Unmentioned in the Constitution, judicial review was John Marshall’s creation, asserting Supreme Court power to declare any law—federal, state, or local—unconstitutional. Marbury v. Madison was one of nearly 1,200 decisions Marshall’s court would deliver during his thirty-five years as Chief Justice. The longest serving Chief Justice in American history, he wrote nearly half the decisions himself, effectively appending them to the Constitution to form “the supreme law of the land” as a bulwark against tyranny by ambitious executives and legislators.